A renewable energy project will be carried out in Kingsey Falls in the coming months. Yesterday we announced a major renewable energy project that we have been working on for several months with Rackam: construction of a solar power plant. This innovative project will supply power to the Cascades industrial complex in Kingsey Falls, allowing us to reduce our consumption of natural gas. The project, expected to be completed by the end of this summer, includes a powerful, ground-installed concentrated solar power system that will be used to produce the hot water and steam required by our industrial complex in Kingsey Falls. We are very proud to say that this is a world premiere in the pulp and paper industry! 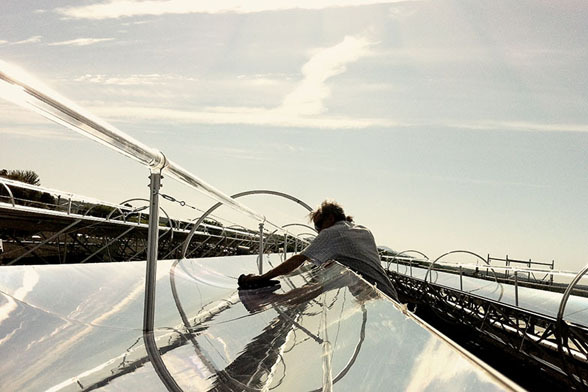 The equipment includes a network of dish concentrators which, when pointed towards the sun, concentrate the sun’s rays on a target in order to increase temperature. The target is a vacuum tube carrying a heat transfer fluid, which is heated and then used to transfer the captured. The system is designed to resist bad weather such as rain, snow and strong winds. 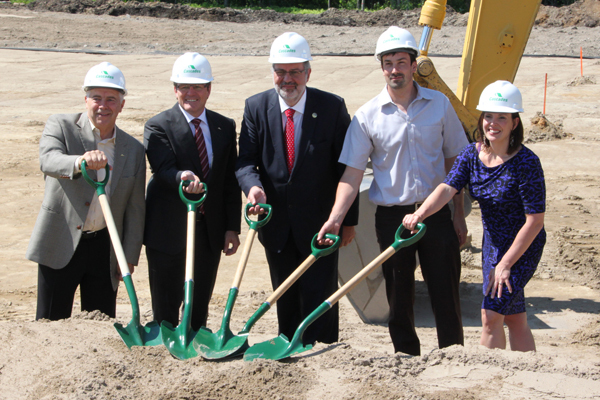 The small Sherbrooke-based company is going the extra mile by creating this project with us. The concentrators that will be used are twice as big as those previously created by Rackam. These new-generation collectors are both more powerful and more economical and also specifically designed for installation on the ground. The 1,490 m2 concentrated solar power (CSP) system will be installed on a 4,000 m2 lot. It is a $1,073,830 project, including a $463,500 grant from Quebec’s department of energy and natural resources and a $76,000 grant from Gaz Métro. When complete, the installation will produce more than 4,440 GJ/year that will be used to raise the temperature of 87,500 m3 of pressurized water from 106°C to 118°C yearly. The installation will generate yearly savings of 139,700 m3 of natural gas. Less natural gas will also mean fewer greenhouse gas (GHG) emissions, with reductions of more than 265 tonnes of CO2 equivalent per year, or 5,300 tonnes of CO2 over 20 years. Once again, Cascades is a sustainable development pioneer. Our company is already two times more energy efficient than the Canadian pulp and paper industry average. The project, which was launched in collaboration with a partner from the region, will allow us to still further reduce the environmental impact of our activities, in addition to reducing our natural gas bill.